This high-quality list of references is edited by Giorgio Apostolo, the best known and most respected Italian Aviation Historian and the author of several authoritative texts. Volumes contain text in both English and Italian. This is the complete history of Aermacchi written by Giorgio Apostolo, the foremsot authority on Italian aviation history. With over 200 color and black/white photos, this reference is the definitive history of this great aircraft manufacturer. English text. 144 Pages. Hardcover. Size: 24 cm x 32 cm. 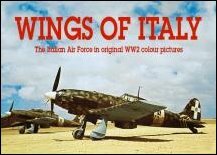 A highly regarded and prestigious reference placed back into print containing more than 250 color photographs from original archives of the Regia Aeronautica taken between 1940 - 1945. 216 pages. 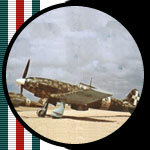 "With over 70 photos and color profiles, learn about one Italy's most famous and highly regarded pilots. A highly skilled civilian pilot, Niclot was the test pilot for Breda during the development of the ..." 64 Pages. English Text. Written by Giovanni Massimello. Laminated cover. Size: cm 21 x 29.7 cm.